Studies have shown a higher incidence of dry eye among patients with diabetes compared to patients without diabetes. However, information regarding dry eye in patients with proliferative diabetic retinopathy and laser therapy indication is not sufficient. To estimate the clinical manifestation of dry eye syndrome in patients with proliferative diabetic retinopathy and laser therapy indication. 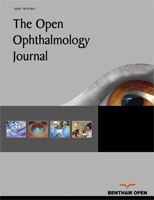 A cross-sectional study was performed during a local evaluation campaign of diabetic patients with vision disabilities at the Instituto Cearense de Oftalmologia in Fortaleza, CE, Brazil. Patients with proliferative diabetic retinopathy and laser therapy indication were included in the study. An anamnesis directly to dry eye complaints was performed, and eligible participants completed the Ocular Surface Disease Index (OSDI) questionnaire. The slit lamp examination was performed with fluorescein staining; the tear break-up time (TBUT) was measured, and conjunctiva and corneal was evaluated using Rose Bengal (RB) staining. Finally, the Schirmer I test was performed. Twenty-five patients were included in the study with a diagnostic time of Diabetes Mellitus ranged from 1 to 35 years, with an average of 17.2 ± 8.7 years. In our sample, 14 patients (56%) reported glycemic control with insulin, while 11 patients (44%) had oral hypoglycemic agents. The most prevalent complaint was blurred vision (96% of patients) followed by low visual acuity (92%). A less prevalent complaint was pain (44%). The mean OSDI score was 49.4 ± 24.2. TBUT was less than 10 seconds in 21 patients (84%), and RB staining grade was more than 3 in 13 patients (52%). The results of the Schirmer I test ranged from 2 to 35 mm, with a mean of 13.57 ± 9.78 mm. It was smaller than 10 mm in 15 patients (60%). The frequency of manifestation of dry eye syndrome was very common in patients with proliferative diabetic retinopathy and laser therapy indication. Ocular surface care should be provided for those patients with significant ocular morbidity. Keywords: Diabetes mellitus, Dry eye syndrome, Diabetic retinopathy, Laser photocoagulation, Laser therapy, OSDI. © 2019 Dutra et al.